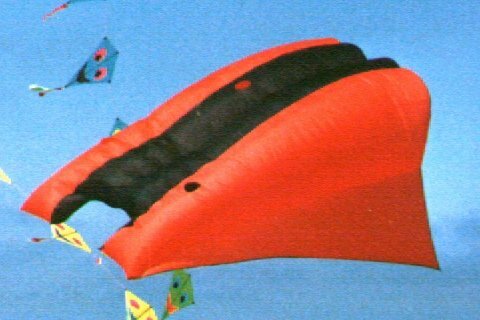 I have built the flowform (not the junior) from the book 'Soft kites and windsocks' of Jim Rowlands and I am satisfied with the flying of this kite. I used it several times for kite aerial photography on different wind speeds. In gusty wind I use a tail of ribstop with a length of about 7m. This kite aerial photo was taken by Ralf Beutnagel after the International Kiteflier Meeting in 1995 on Fano. In the magazine kitelines I saw the advertisement of Air Affairs. They offer flowforms in different sizes. They have four chambers, three bridle lines and a small aspect ratio. The most used sizes are 16 and 30 square feet. Once I had the chance to hold those kites in my hand. I build such kind of kite with a size of 50 square feet to have enough lifting power in light air. After finishing that kite I got the plans from the book 'Kites for everyone' from Margaret Greger and the plan from Carl Crowell. 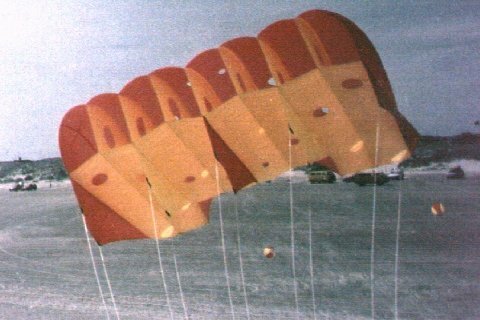 Those kites look like the flowforms from Air Affair, too. With the back view you can see the lines which build the profile at the trailing edge. I made this to solve a mistake I have done with the center profile. In the original kite the center profile ends at the trailing edge. 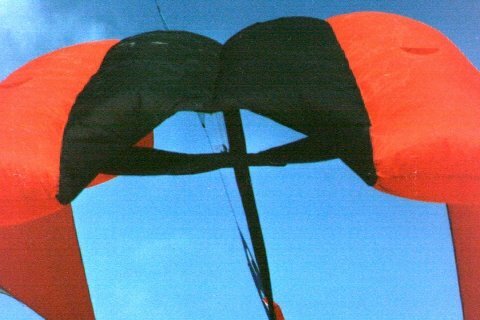 I think with all lines for the inner profiles there is not so much lift at the end of the kite and it will fly in a wider range of wind speed.